"Help Me Do It Myself"
Our CMS Primary Classrooms are truly magical places. Every child is respected as an individual and each student’s educational experience is tailored to meet his or her specific needs. At any moment in the Primary Classroom there is a hum of activity as children choose from a rich offering of activities. A three-year-old might be arranging flowers in vases, while a four-year-old might be building words with a language work called the movable alphabet, while a 5 year-old is exploring multiplication using bead work. Children under 6 have an extraordinary and once-in-a-lifetime ability to absorb knowledge from their surroundings just by living! They take in their environment with what Montessori referred to as the “absorbent mind”, which is at peak receptivity during the pre-school years. In order to be calm and happy, children need to investigate and discover. 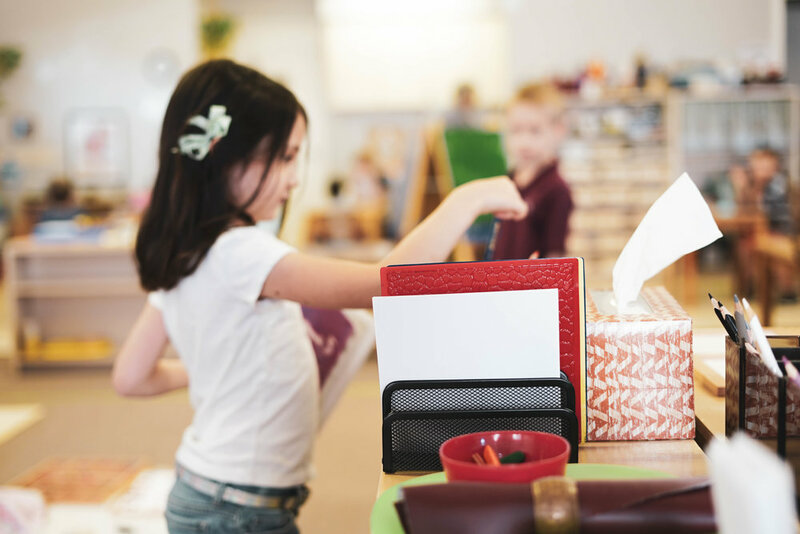 Children are encouraged to explore through their senses by touching and handling materials, which helps to fulfill their innate need to figure out where things belong and how pieces fit together. During work time, children receive lessons from their teachers, but also choose activities on their own, which engages them in their own education. Our Primary Classrooms provide students with a wonderful foundation that includes a positive attitude about school, inner security and a sense of order, pride in the physical environment, development of concentration, habits of initiative and persistence, the ability to make decisions, self-discipline, and a sense of responsibility to other members of the class, school, and community. This foundation will enable them to enjoy acquiring more knowledge and skills throughout their school career. Montessori kids know that learning is fun! Children love to take part in the activities of daily life! 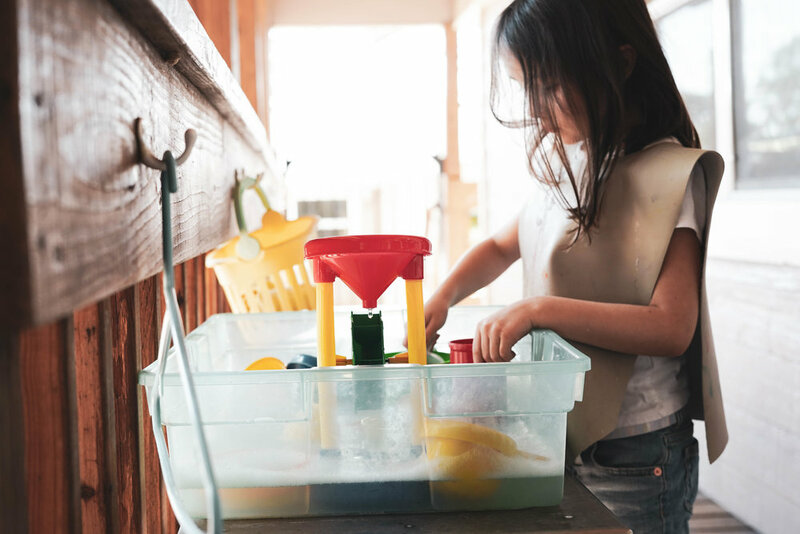 With child-sized tools that really work, the young child is able to perform activities such as: watering plants, washing, sweeping, arranging flowers, preparing food, cleaning up spills, and everything that comes along with self-care as well! Children live in a world of sensations and it is through their sense that children build their understanding of the world and build their intellect. Sensorial materials enable the child to order, classify, and describe sensory impressions in relation to length, width, temperature, mass, color, pitch, etc. Unique Montessori materials make understanding math accessible and understandable and enable the child to internalize concepts of number, symbol, sequence, operations, and memorization of basic facts. In our classroom the child hears and uses rich vocabulary, learns the names of textures, geometric shapes, composers, plants, geography, mathematical operations, and the like. In addition, storytelling, poetry, songs, and language games build a foundation for literacy. Activities expose the child to basics in geography, history, and life sciences. Music, art, and movement education are part of the integrated cultural curriculum. Students also spend time cooking, baking, gardening and composting!